So, Tsunimee and I were bitching on twitter that we didn’t really like metallic finishes to our polishes, and of course… that same day one of THE MOST BEAUTIFUL metallic nail polishes EVER showed up in my little ASOS haul. It has that Quality Street wrapper quality doesn’t it? I love it. And this photo… does not do it justice. In real life, it looks like someone has foiled my nails with this glorious jeweled ruby red. It’s perfect. It looks like there are brush strokes in the image… which is hugely unfair, because I’m squinting at my fingertips now and I just can’t see any. You pop off the clunky square ‘lid’ with a sharp tug and it reveals an altogether easier to manipulate round handle for application purposes. Unfortunately, the brush is a STUPID thin thing, like in my Orly polishes… but other than meaning it needed about 5 strokes to cover the nail bed, it didn’t cause me any issues. Application was *nearly* spot on. Opaque in the first coat, I needed to go back in for a second just to tidy it up…. however, I did experience a couple of bubbles on 2 nails, which sucked especially as I know I wasn’t applying it too thickly. Still, it’s so beautiful I don’t really care. Plus, when the polish had dried (very quickly I might add) I could barely see these two bubbles… but I needed to mention it as bubbling isn’t something I usually experience with polishes. Longevity is amazing for a metallic, I’m on my 3rd day (with no top coat) and it looks as good as new. What are your Butter London favs? That looks gorgeous on you! Never tried a Butter London polish but now I want to! Oooh, this is stunning I love it! *kaboom* that was me falling off my chair! I have never seen any metallic nail polish to look that gorgeous. You are right, this is THE red you would expect from a classic red nail polish. They look like rubies meeting a ripe cherry on every finger. 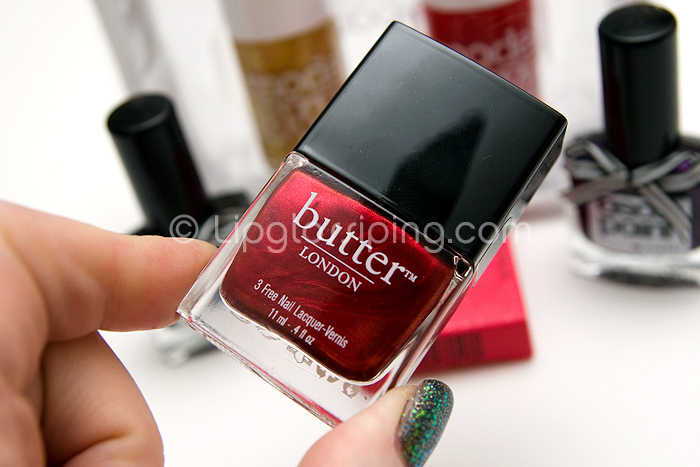 You have got to contact those people at butter london: they have to see this! I don’t think they have an asos beauty ‘representative’ on twitter. It’s a shame, as I would have loved them to see those cherry jewels. wow! I suppose I better take back what I said about metallic finish polishes lol. Or that could be the exception which confirms the rule? Jeeeeesus christ that is beautiful! I’m not normally one for metallics either but I think I need this. Now that really is stunning!!! I’ve been looking at Butter polishes for a while now on ASOS but the £10 price tag has always put me off, think I might have to get me some though. I love it! It’ll probably look great on short nails too! that colour polish in that bottle is a work of art in itself – gorgeous. its a very classy red! Your nail posts has inspired me to do a OPI/Essie haul and they just arrived today 😉 woohoo! what do you think of the ASOS colours? I got the Alex/Sienna duo set.. nice colours but they chip really easily ! I’ve never tried Butter polishes, but now i might have too, this one looks gorgeous! That’s such a stunning bold color, I love it! @Nicola – I *still* haven’t gotten round to trying them yet! I wonder if they’re different to the standard Ciates?